Sorry it’s been a little quiet over here at Subscription Therapy. The nature of my boring day job is that it gets crazy at deadline time and since I’ve been fighting off a cold as well, it’s been hard to get in my time with you all. But I’m back and ready to talk boxes. 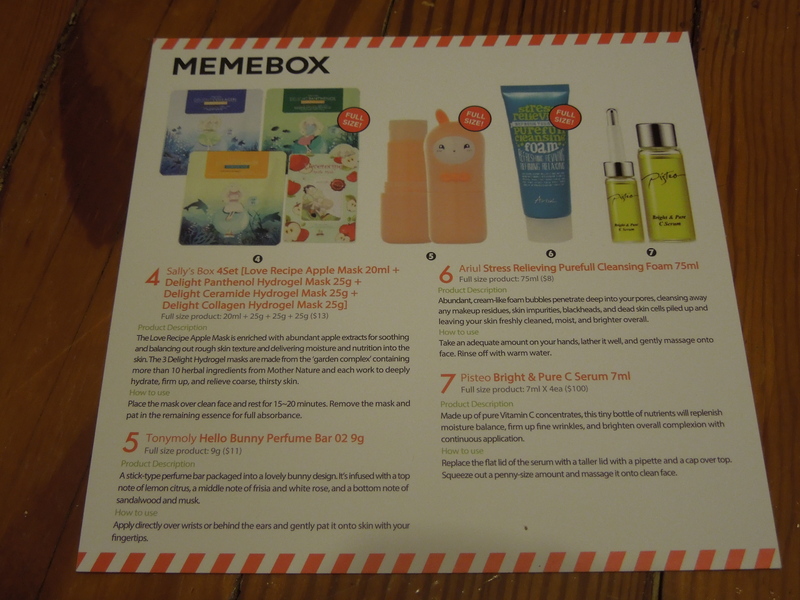 So Memebox, is a Korean beauty box where you buy individual boxes (rather than a monthly sub). I went crazy a few months back buying a ton of them (which I promise I will get around to reviewing) but then all went quiet at Memebox. They restructured their affiliates and VIP programs and it seemed there were next to no new boxes. But now, they are back with a vengeance and I am constantly getting emails about new stuff. 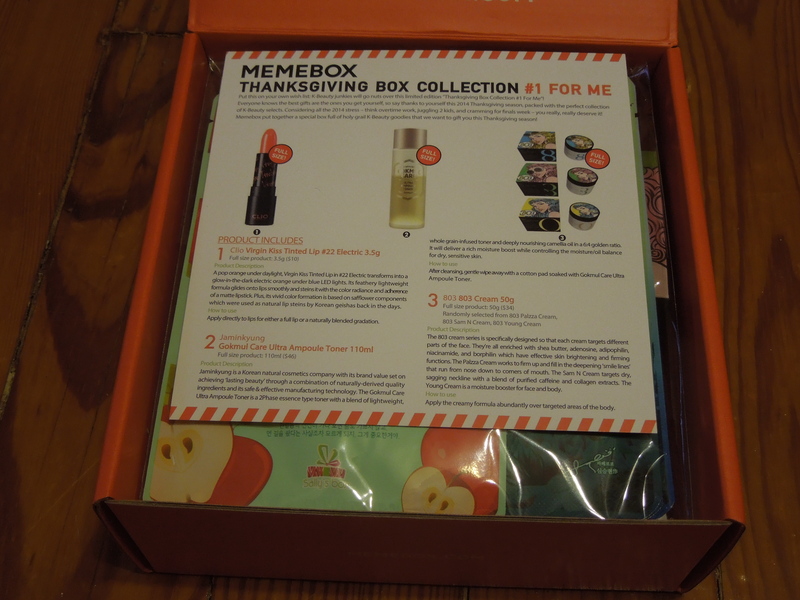 It turns out that it was Thanksgiving in January since Memebox graciously sent me their intriguing Thanksgiving Box Collection #1 for review. This should be particularly entertaining since I’m not exactly sure Koreans totally get American Thanksgiving. It’s currently sold out but the original cost was $26 plus shipping. Thanskgiving: I do not think it means what you think it means. Now it sounds like this is just supposed to be a pampering style box where you are “thankful” for yourself. Seems odd. I also think Americans are going to expect products that have something to do with the Thanksgiving season itself – like pumpkins and warm spices. But this box claims to have “holy grail” beauty goodies so let’s see if it lives up to the hype. 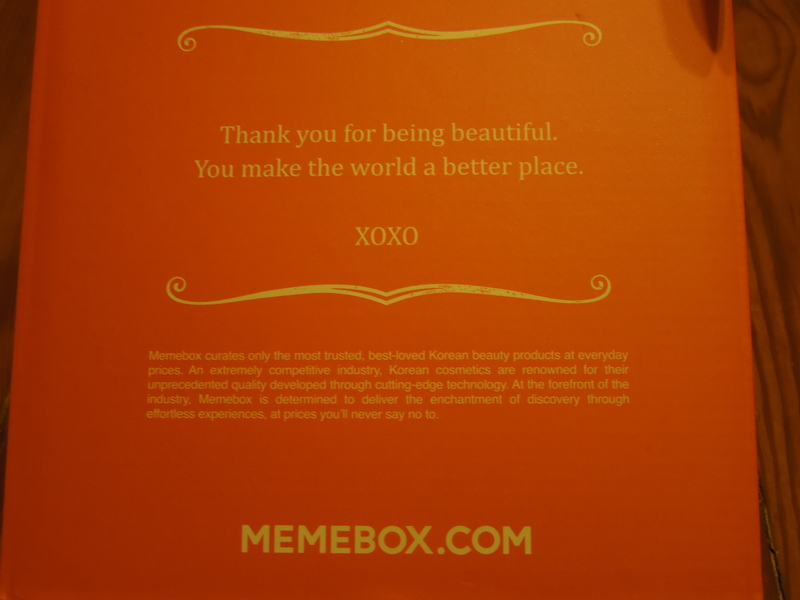 To start our signature pink Memebox has gone orange and there’s some cute quotes on the inside flap. And what I’m most thankful for is the usual dual-sided card that translates (or tries to translate) the Korean product labels. Some products are self-explanatory but a lot of them really really need that card. Verdict: What you talking bout Willis? Let’s assume “steins” really means “stains”, shall we? Well, orange is a Thanksgiving color, but a glow in the dark lipstick seems far more suited to a Halloween box than a Thanksgiving one. And it goes without saying that age wise this is super young. Outside of costume applications there aren’t a huge range of women who want glow in the dark lipstick. There also aren’t a huge amount of women that can pull of electric orange lipstick. 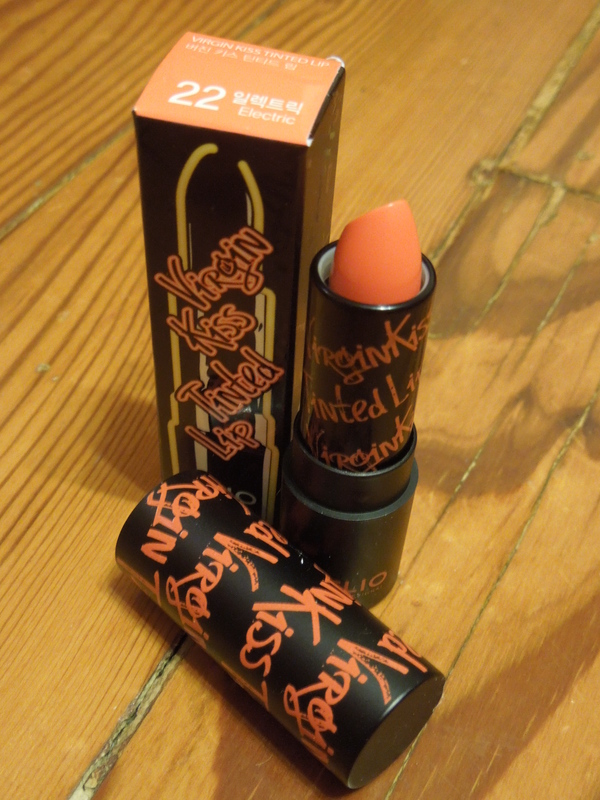 Unless you’re $kesha, I can’t imagine glow in the dark orange lipstick is a “holy grail” beauty product for you. The 64 Golden Ratio? I wasn’t aware there was math on this test. In any case, I love trying natural products and I use moisturizing style toners every night so this will definitely get used. As for the box theme, it goes with self-pampering, but not so much with what most folks would think of with “Thanksgiving”. 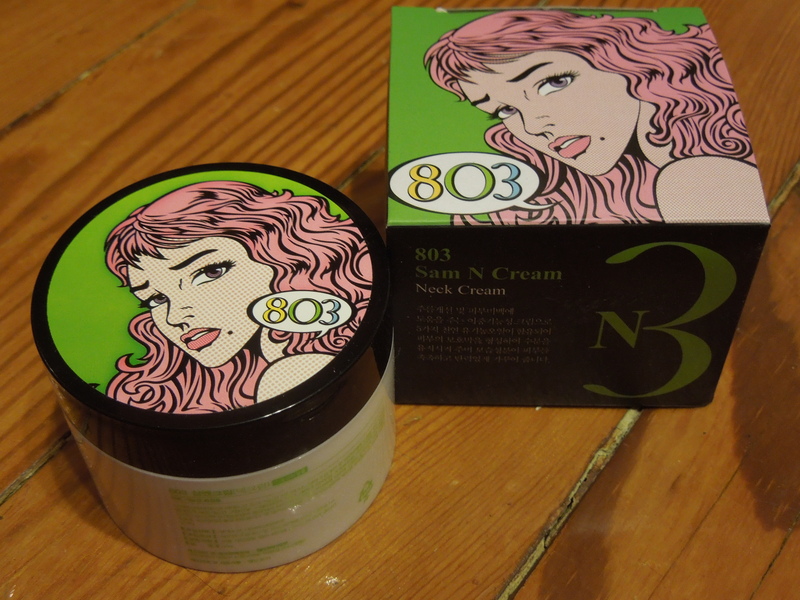 So I got the neck cream which is used to combat jiggly turkey neck. 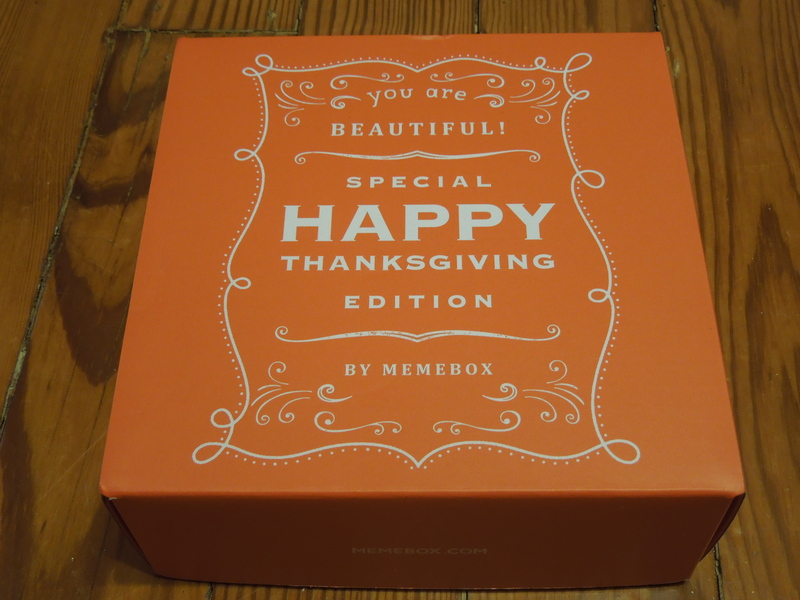 So this item both fits American Thanksgiving and the Memebox “give yourself stuff” Thanksgiving. I would have preferred one of the other creams since I’m not really at the point where my neck is an issue. That begs the question of who on earth needs both a glow in the dark orange lipstick and a neck cream? Like is someone’s 70 year old grandma going to a rave? 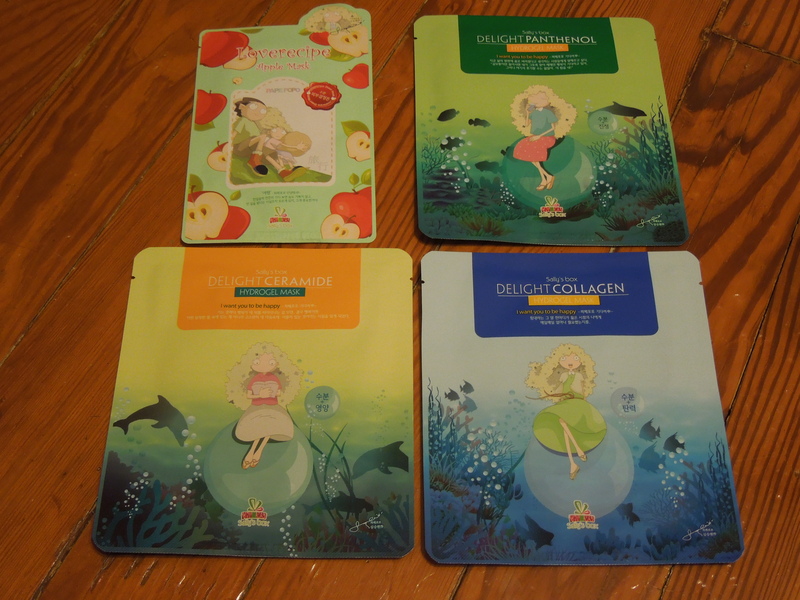 I always like getting sheet masks. They are fun to try and easy to use. The “apple” masks fits in with Thanksgiving and is pampering so I think this one works pretty well within the theme. Verdict: Come on it’s in a bunny! 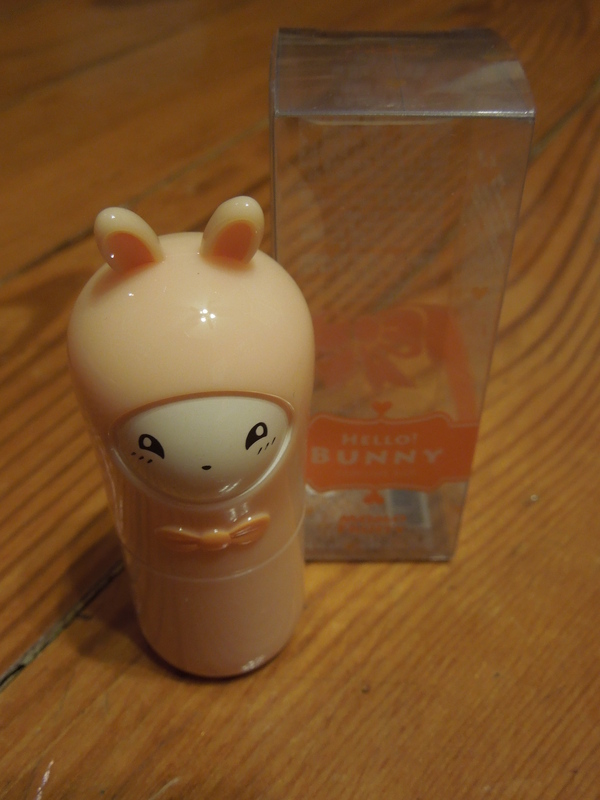 Tonymoly stuff is always fun and the packaging on this is adorbs. The scent is fresh and a bit citrusy and I actually like it, so for a change I’m keeping a perfume for myself. I also love solid perfumes and I think that there should be more of them out there. They are great to take into your bag for freshening up during the day, easy to travel with and last so much longer. I’m not sure the bunny really fits with Thanksgiving, but it’s cute so I don’t care. Cleansers are very practical and are items you tend to go through pretty quickly so they are always good in boxes. This item is playing up the “stress-relieving/gift to yourself” angle but I do wish they’d gone with something that felt more thanksgiving. Like an apple or pumpkin cleanser or just a dessert themed one. Now Memebox claims this is a$100 value. They tend to over-inflate the values on these products and since it’s not easy to find a lot of them, it’s hard to have a real idea of the costs. Serums are always a great bet for a nighttime routine. If you don’t want anything to fussy at night, just use a anti-aging eye cream and a good serum and your skin should be in pretty great shape. 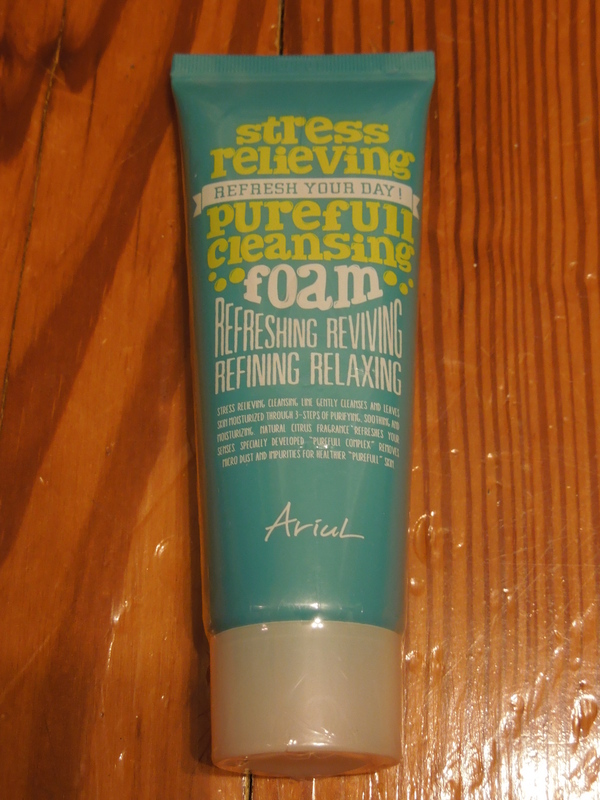 This is another practical product and I can definitely see the pampering aspect, even if it doesn’t feel “Thanksgiving” to me. There were a lot of good products in this box. The big problem it had was uneven curation and a theme that maybe was not the best choice for an American market. As I mentioned earlier the type of person that needs a neck cream probably doesn’t want a glow in the dark lipstick. And when you say “Thanksgiving box” to an American audience they are going to expect food or fall themed items to be included. 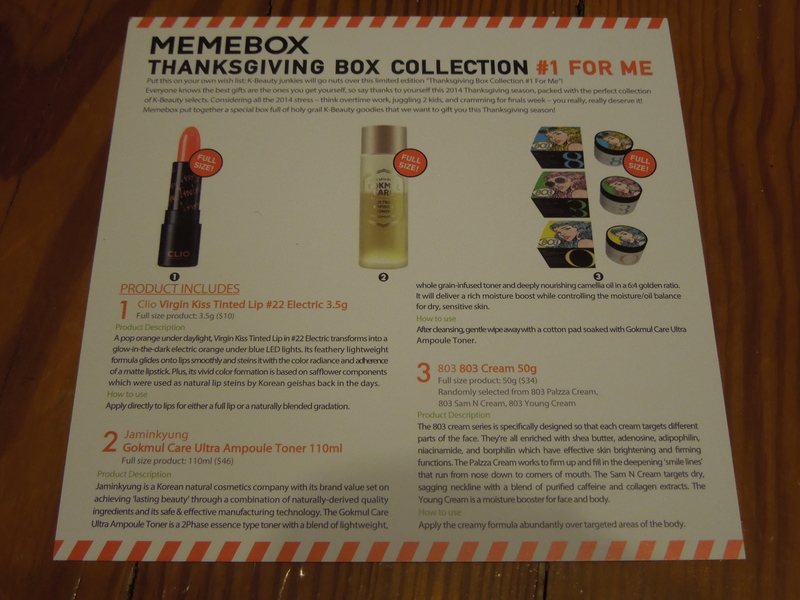 I know Memebox tried to play up the “pamper yourself” aspect, but you can still do that and use items that feel right for the Thanksgiving season. I also don’t feel like everything in here really fits in the “holy grail” of Korean beauty products. 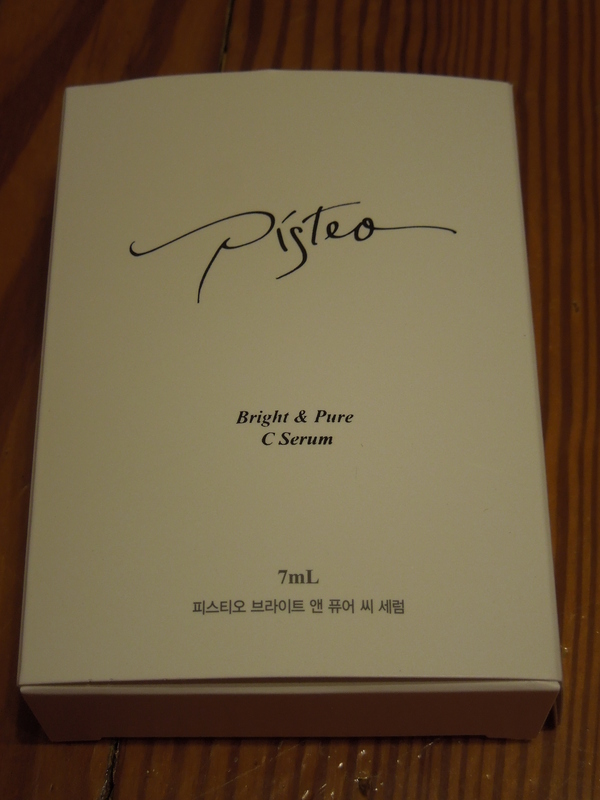 If I’m thinking Korean Beauty staples I expect things like CC creams and liquid eye liners. 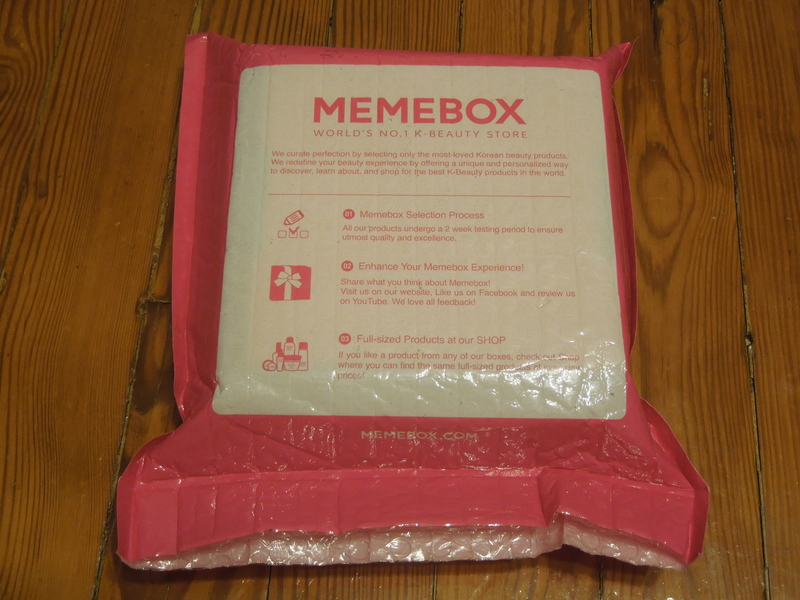 According to Memebox, the retail value of this box was $212.00, but again they inflate their prices so it’s probably less than half of that. I got this box for free, but it retailed at 26 plus shipping. For the amount and size of products I do think it’s a great deal at that pricetag. 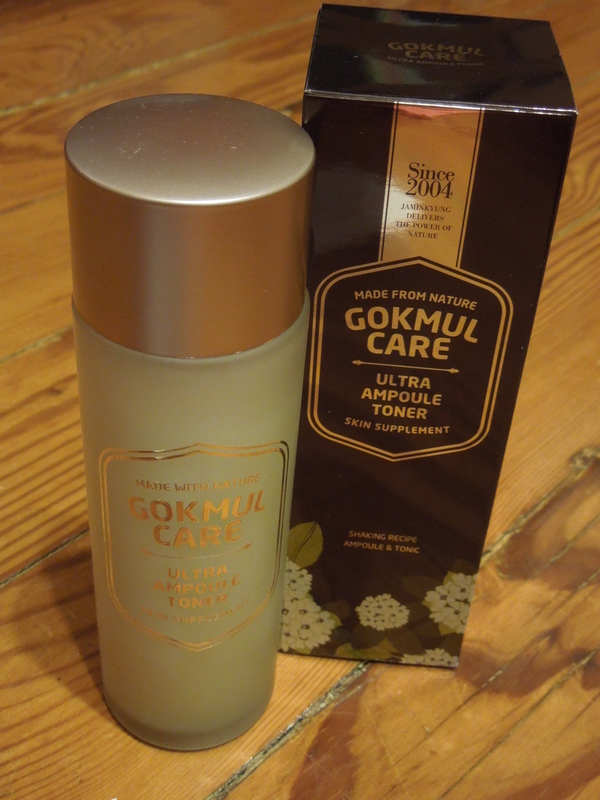 The toner, face masks and perfume were all a hit for me and I’ll use the more practical cleanser and serum eventually. The only huge miss was the lipstick that I’ll have to give away to someone younger and cooler. 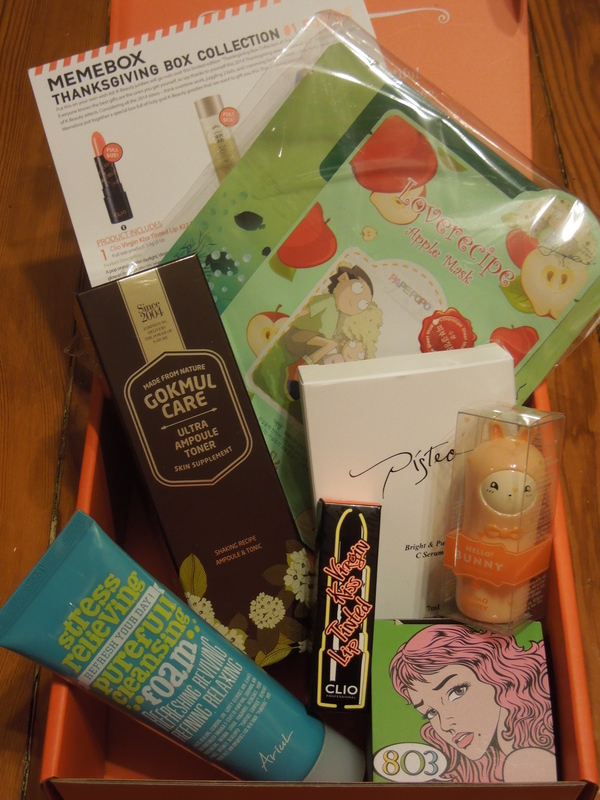 I’ve still got a backlog of Korean beauty boxes so if you enjoy the Memebox posts be sure to come back for some more fun makeup and skincare finds. What would you expect in a Thanksgiving themed beauty box? There’s a new Valentine’s Day box on sale! Description: “Treat yourself this Valentine’s Day. We’ve filled this limited edition V-day box with goodies to create a luxurious experience during this romantic holiday. Whether you are going out on a hot date or it’s more of a ‘National Singles Awareness Day’ for you- you will definitely find some essentials that are perfect for a ‘pamper yourself’ kind of day. Get your pretty on!